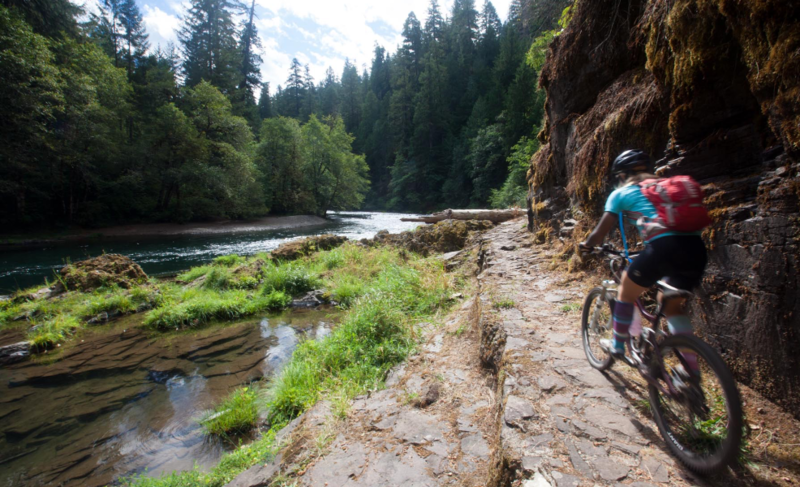 Ride miles of gorgeous, uninterrupted singletrack along Oregon’s Umpqua River over this 5 day, 4 night trip. 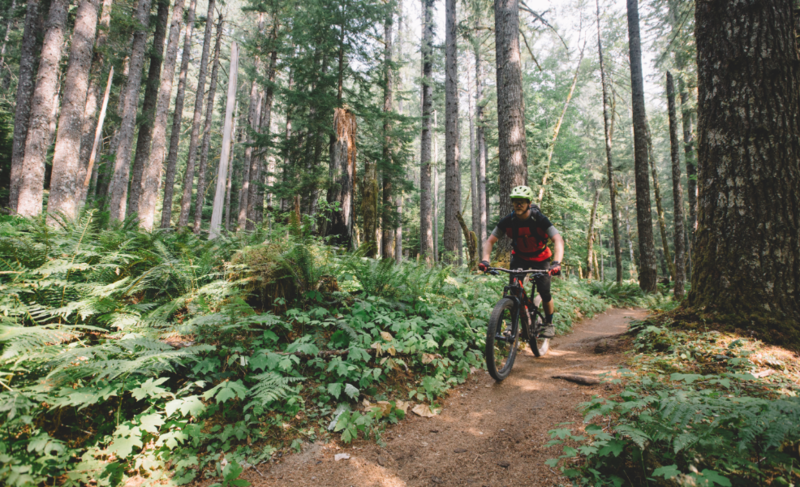 This fully guided mountain bike trip package, powered by our partners at Western Spirit, travels one of the Northwest’s longest and most beautiful uninterrupted pieces of singletrack. 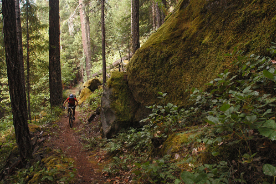 The 5 day and 4 night trip takes mountain bikers on a progressive journey along the North Umpqua River Trail. 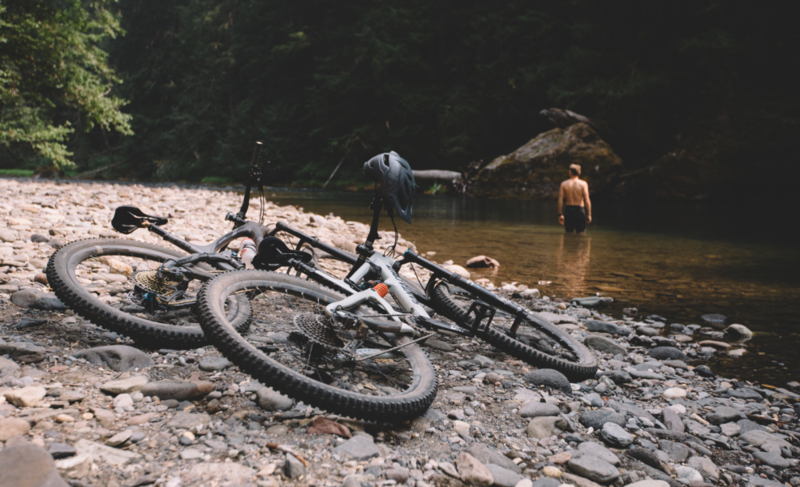 Starting at 4,000 feet above sea level and finishing at around 800 feet, this ride descends through old growth forests, across clear flowing creeks, and next to snowmelt-filled freshwater lakes. 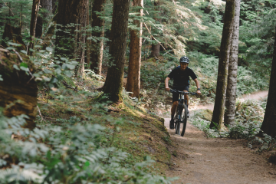 Riders should expect to experience tacky fast dirt, small cobbled rock gardens, and trail that has been perfectly designed through decades of care and stewardship. 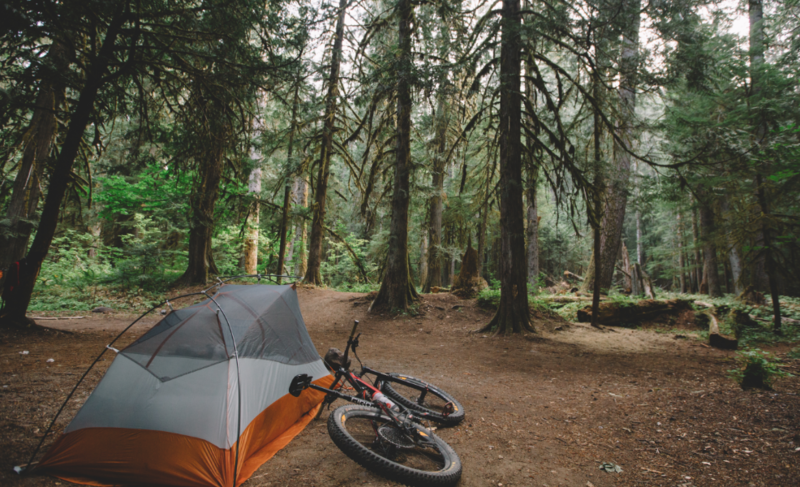 Our Umpqua River mountain bike trip will travel a new section of trail each day before riding into a new camp each night. Each camp offers amazing swimming and hiking options in one of the most beautiful river valleys in the Northwest. Guides will carry your equipment and luggage in a support vehicle that will meet you at their destination. Riders will be accompanied by a guide each day. Arrive in Medford the day before the trip departs to give enough time for tomorrow’s early 8:30 am meet up and departure. Stay the night in the hotel of your choice (we recommend the Hampton Inn Medford, a 5 minute drive from our meet-up spot) and relax in town before 5 days on the trail. Guests will meet the shuttle at Marty’s Cycle in Medford at 8:30 am and travel 3 hours to Lemolo Lake at the northern end of the North Umpqua River Trail. We’ll unload and have a quick lunch before our ride. We will start with a contouring section of trail that is a great warm-up and precursor to the week’s ride. After today’s 16 mile ride we’ll return on the same trail to our beach-side camp and enjoy dinner. Today is the big day, more for the name’s sake than the mileage. Today’s trail section is called Dread & Terror. The trail is very well constructed - it is etched into the side of a steep gorge, though there are some exposed moments. We’ll pass Lemolo Falls, a 135 foot horsetail waterfall, enjoy a packed lunch in the canyon and eventually meet the van for a refreshing beverage. We ride another few miles to our open meadow camp just up from Toketee Lake. There is a great side trip to the dramatic Toketee Falls for the extra energetic and a handy swimming option right from camp. Today’s ride is 17 miles with the option for additional riding. From Toketee Lake we go east on the North Umpqua River Trail - the Deer Leap Section. This is impressive trail building at its best with lots of ups and downs through massive hemlocks, cedars and douglas fir. We will climb above the river and get great views of the surrounding valleys before breaking for lunch at the Soda Springs Dam. After 18 miles of riding we will arrive at Horseshoe Bend, our campground on the river, with a true sense of “umpqua” or satisfaction. Today’s section of the North Umpqua River Trail includes some challenging ups and downs with great views of the river. There are some fun side canyons that we contour as we follow the river east. Make sure to keep an eye out for salmon hurling themselves skyward as they make their way back upriver to spawn. We will leave the North Umpqua Trail and head across the river to the Riverview Trail as we cruise to our camp at Bogus Creek. After 14 miles we can enjoy some riverside lounging or hop back in the saddle for another 6 mile loop to the spectacular Falls Creek Falls. We have saved some of the best trail and the best challenges for today. The first part of our ride is similar to the last few days with the addition of some steeper climbs and descents. After climbing around Susan’s Creek we will climb again to top out on Bob’s Butte (about 1,500 feet of elevation gain). From here we’ll enjoy a well earned picnic lunch followed by a ripping descent back down to river level. We finish our ride at a giant swimming hole with a beautiful granite beach where we will load up the shuttle and head back to Medford, we should arrive between 3-4 p.m. In the early 1970’s, local trail advocates envisioned a trail extending from Rock Creek to the Cascades. 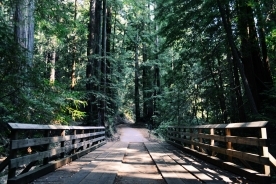 Construction finished in 1997 and the North Umpqua Trail was born. 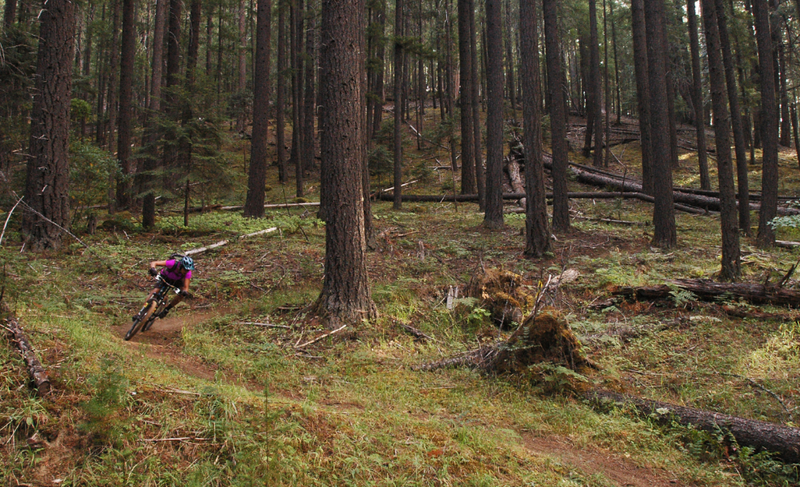 The trail itself provides over 70 miles of singletrack from 10 major trailheads. The trail is mostly smooth, with perfect trail tread with excellent traction. 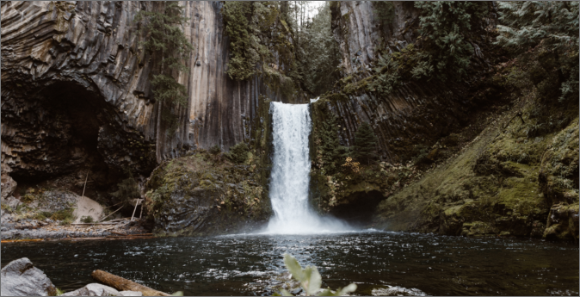 Undulating through vast and diverse forests of mountain hemlock, western cedar, and the mighty Douglas fir, while passing large cascading waterfalls this trail showcases all that southern Oregon have to offer. Feel free to bring your own mountain bike, or you can get a rental (2019 Specialized Stumpjumper ST with a helmet) from Western Spirit. If you bring your own, please make sure it's in tip-top shape before you arrive. Biking and camping temperatures can range from the low 50’s to the high 80’s so dressing with layers is essential. The bulk of your gear and clothing will ride in the Western Spirit support vehicle (preferably in a large duffle bag) and will not be accessible during the day. Your riding pack may be a hydration pack, and needs to carry 2-3 liters of water, rain gear, other warm clothing, and food for the day. You may be away from camp and the support vehicle all day so make sure you have everything you need for a day on the trail. Note: Towards the second half of the trail we are aware that poison oak is common. We provide nylons to cover legs and arms while riding as well as a wash which we ask everyone clean up with post ride. This has been very successful for us over the years in keeping all of our guests itch free. However, if you are particularly sensitive and would like to take extra precaution, please bring tall socks and long sleeve cycling jerseys for the final 3 days of the trip. Please note evo defers to the operator's cancellation terms. Should you need to cancel for any reason, Western Spirit will apply the following cancellation policy: For cancellations prior to 60 days before departure, a $50 handling fee per person is retained and the remainder of your deposit is refunded. For cancellations 60-31 days before departure, 50% of your trip fees are refunded. For cancellations 30 days or less before departure, no monies are refundable. Food and non-alcoholic drinks for the trip, guides, support vehicle, campsites, permits, and any entry fees into national parks and public lands. Travel to and from Medford Oregon and any pre-trip or post-trip lodging. Travel insurance (we recommend World Nomads). Personal camping gear (can be rented from Western Spirit for $90 per trip ). Mountain bike (can be rented from Western Spirit for $55 per day). Alcoholic beverages. Guide gratuity. What skill/experience level is required for this trip? This is an intermediate-advanced mountain bike trip. You should have experience mountain biking on singletrack and feel comfortable descending and climbing on narrow trail. 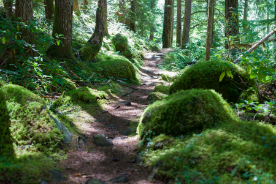 The trail surface is made up of loamy soil, clay, rock, and small sections of river beds. Riders should expect to be in the saddle for about 4 to 6 hours per day. 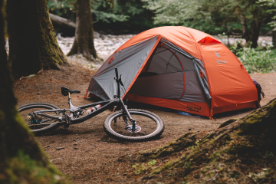 Can I bring my own camp and bike gear? Certainly! If you bring camping gear, please bring a tent, sleeping bag, and sleeping pad. We’ll provide everything else you need. Don’t worry about the camp chairs—we bring those too! Please make sure all your gear is in excellent, working condition before you head out on your trip. 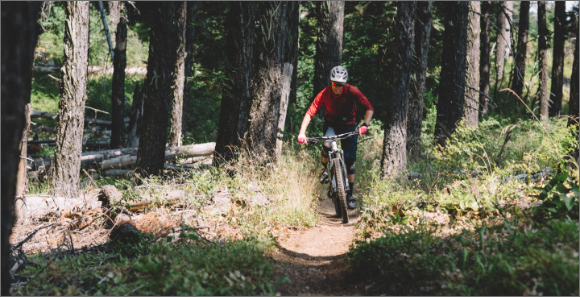 We recommend a full-suspension mountain bike If you’re bringing your own bike, please make sure it has been tuned up and is in excellent riding condition before the trip. What bike rental do you offer? What will the food be like? Can you accommodate my dietary restrictions? We take our food seriously. We know that eating 3 great meals a day helps everyone enjoy the ride. For that reason we can handle almost all dietary restrictions. It is common to have vegetarians, vegans, paleo diet followers, etc… all on the same trip. We will ask you before the trip to fill out a questionnaire where you can indicate your dietary preferences and restrictions. We call it “glamping”, or comfortable camping. 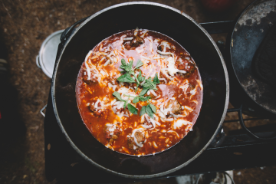 Basically, we take care of all of the details like solar showers, hand wash stations, commercial kitchen, tables, chairs, rain and sun shelters, fire wood, and everything else that you will need to be as comfortable as possible in the backcountry. It’s certainly not roughing it! How should I pack my gear? We recommend you use a 3-bag system: Camping gear and personal items for camp (gets packed away in the morning and is inaccessible throughout the day), Small daypack (stays in vehicle and is accessible throughout most days, e.g., extra layers, prescription medications, extra snacks, etc. ), Hydration pack you wear (all things you readily need, right there on your back). We recommend a 2-liter hydration system (e.g., Camelbak) to carry the things needed during the day (water, snacks, lunch, rain gear, extra layer, sunscreen, camera, etc. ), and to easily hydrate without stopping. Do I need to bring everything on the packing list? We have carefully developed this list to ensure your comfort on the tour regardless of the weather. If you are prepared for extreme weather, it is an adventure. If you are not prepared, it can be a serious problem. We recommend the layering system, including a wicking or long underwear layer, an insulating layer and a weather barrier for wind and rain. This list reflects that philosophy. weather can be unpredictable so be sure to bring all the warm clothing and rain gear listed! This tour will begin at 8:30 AM PDT at Marty’s Cycle, 712 Crater Lake Ave., Medford, OR; 541- 772-9253. You will need to spend the night before in Medford. What is the minimum and maximum number of guests per trip? We have a maximum of 13 guests on the North Umpqua trip. We do not have a minimum number of guests per trip. Is there a minimum age required for this trip? You must be 18 or older to join this trip. We also allow individuals who are between 14 and 18 if they are accompanied by a parent or guardian. I was worried riding and camping with a group… could I keep up?... would I "fit in"? I was able to keep up and push myself and was challenged by the terrain, I loved it! The group was great I had nothing to worry about, everyone was friendly and supportive. The food was fantastic! I didn't expect such meals. The guides were so friendly, helpful and entertaining. They really worked well together. Also, they made sure that everyone in their various skill levels enjoyed the rides and that there was enough for everyone.